Is North Korea Building a New Submarine? 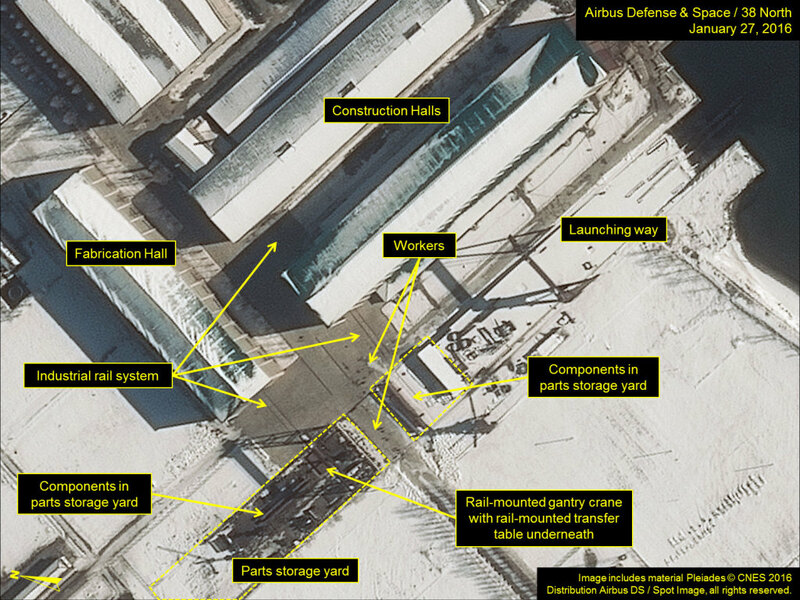 A 38 North exclusive by Joseph S. Bermudez Jr.
Commercial satellite imagery strongly suggests that a naval construction program is underway at North Korea’s Sinpo South Shipyard, possibly to build a new submarine. While there is no direct evidence that the program is for a boat to carry the ballistic missile currently under development, the presence of an approximately 10-meter-in-diameter circular component outside the facility’s recently renovated fabrication hall may be intended as a construction-jig or as a component for the pressure hull of a new submarine. However, it is also possible the ring may be related to another construction project. 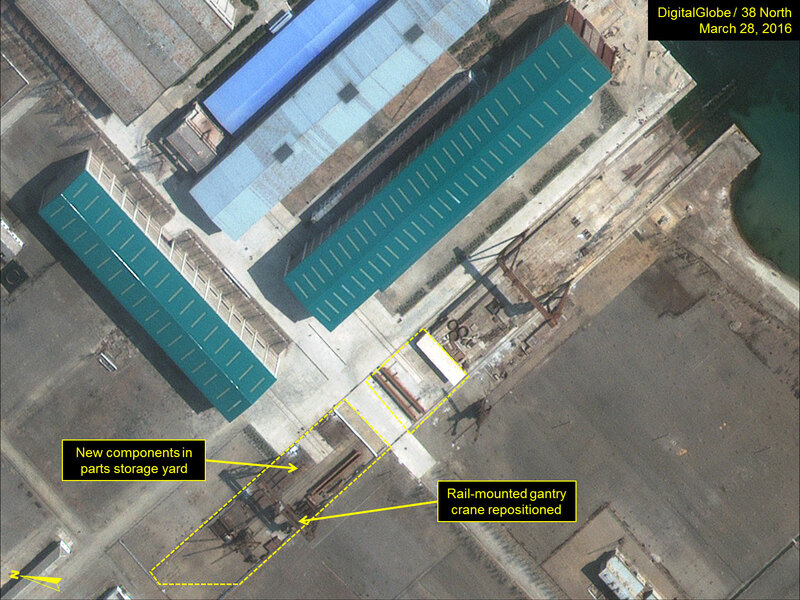 If this activity is indeed to build a new submarine, it would appear to be larger than North Korea’s GORAE-class experimental ballistic missile submarine (SSBA), which has a beam of approximately 7 meters. 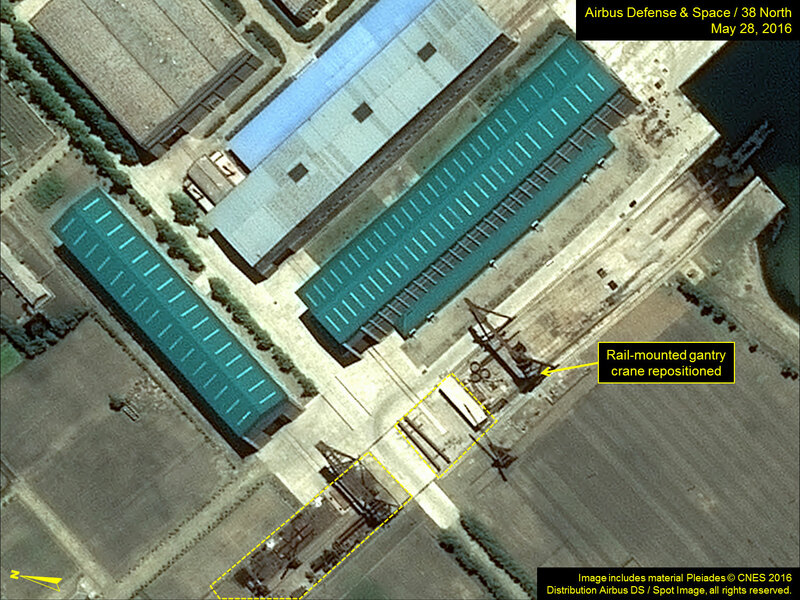 While North Korea has built submarines at a number of locations, the vast majority of which have been built at the Sinpo South Shipyard. The shipyard is also the headquarters of the Maritime Research Institute of the Academy of National Defense Science responsible for research and development of maritime technology, naval vessels and submarines, and naval related armaments and missiles. 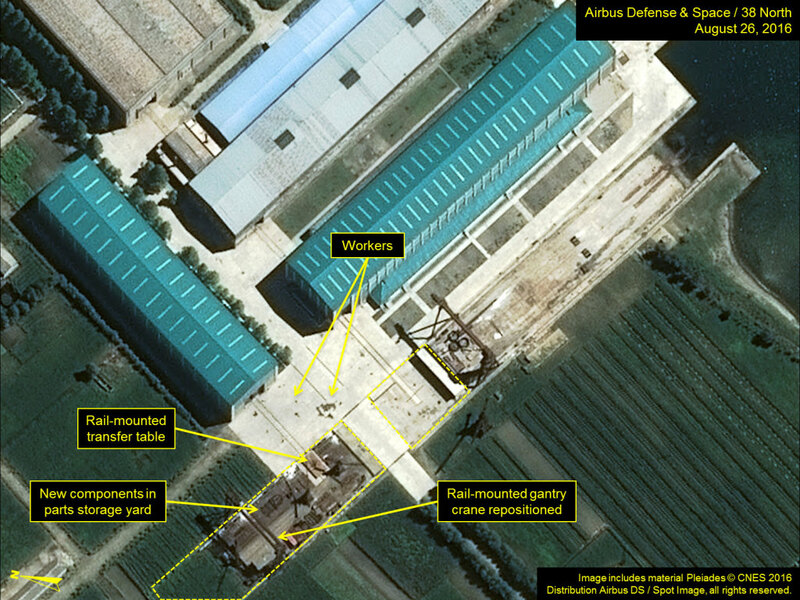 North Korea’s GORAE-class submarine was built and is ported here. Shortly after the launch of this submarine, North Korea began a revitalization program of the machine, fabrication and construction facilities at the shipyard. Most significantly, beginning in 2014, the North focused on renovating the main construction and adjacent fabrication halls that had been abandoned and roofless since about 2010. The fabrication building was externally complete by November 2014 and the construction hall by October 2015. 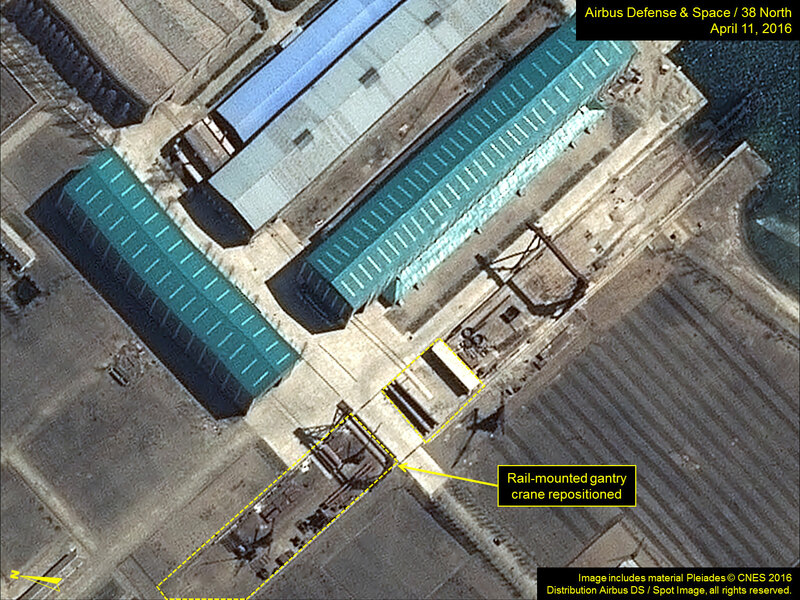 These facilities provide North Korea with the capability to build new submarines much larger than the current GORAE-class or ROMEO-class. The repositioning of the large access doors of both halls. 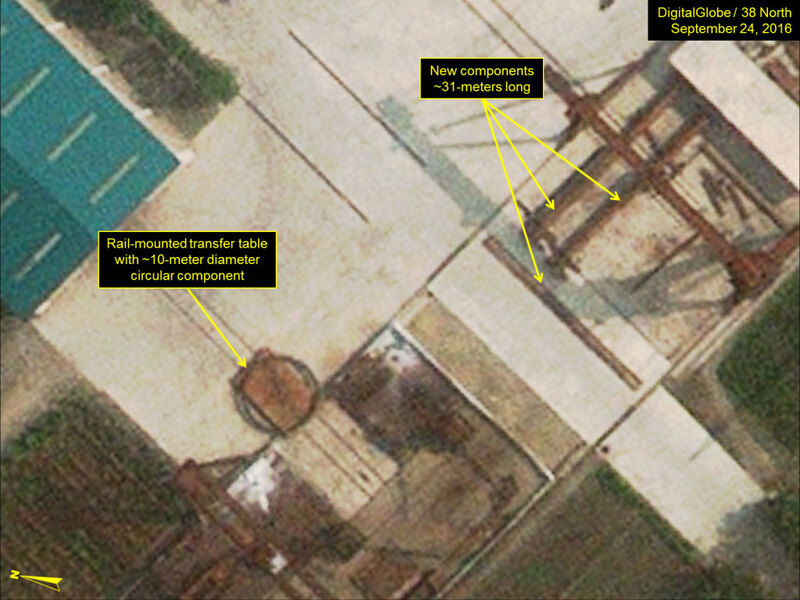 Moreover, imagery from September 24 shows the presence of a 10-meter-in-diameter circular component that may be intended for the construction of a new submarine—either as a construction jig or component of a pressure hull. This component is on a large rail-mounted transfer table outside the fabrication building. Components fabricated here would typically be moved out to the parts yard on a transfer table. Here, a rail-mounted overhead gantry crane would move them from the fabrication building’s transfer table to the construction hall’s transfer table. They would then be moved into the construction hall for assembly. Figure 1. Workers and cranes seen near the construction and fabrication halls in January. Figure 2. Regular repositioning of cranes supporting the parts storage yards. Figure 2A. Regular repositioning of cranes supporting the parts storage yards. Figure 2B. Regular repositioning of cranes supporting the parts storage yards. Figure 2C. Regular repositioning of cranes supporting the parts storage yards. Figure 3. Heavy equipment transporters appear. Figure 4. Workers seen around the two halls and yards, and new components are visible. Figure 5. Large circular component seen at storage yard. Figure 6. 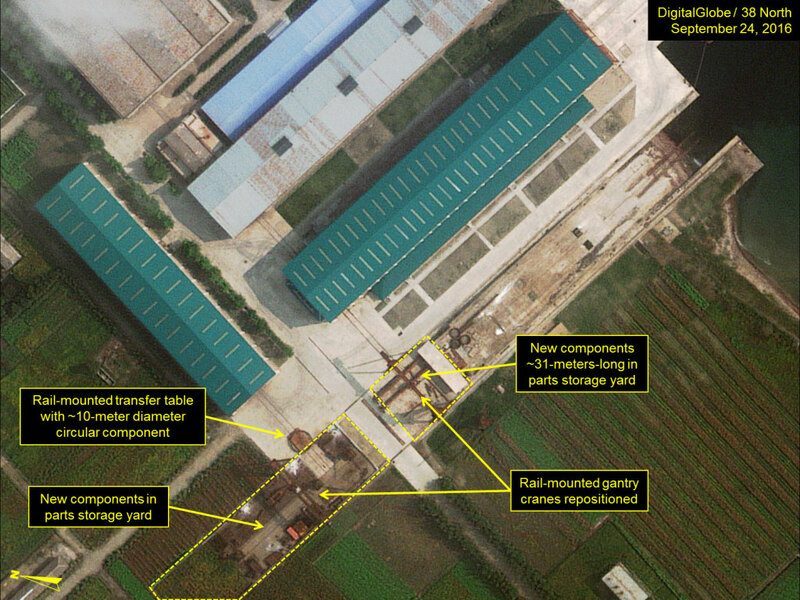 Close up view of new components seen at the storage yard. The GORAE-class submarine is sometimes identified as the SINPO-class because of where it was first seen. See history of ballistic missile submarine development at Sinpo at https://www.38north.org/?s=sinpo. Joseph S. Bermudez Jr., Shield of the Great Leader: The Armed Forces of North Korea (London: I.B. Taurus, 2001) 45-55. Construction halls are sometimes called erection halls. The GORAE-class experimental ballistic missile submarine (SSBA) has dimensions of approximately 66.7 x 7.7 meters and the ROMEO-class are attack submarines (SS) armed with torpedoes with dimensions of 76.6 x 6.7 meters. 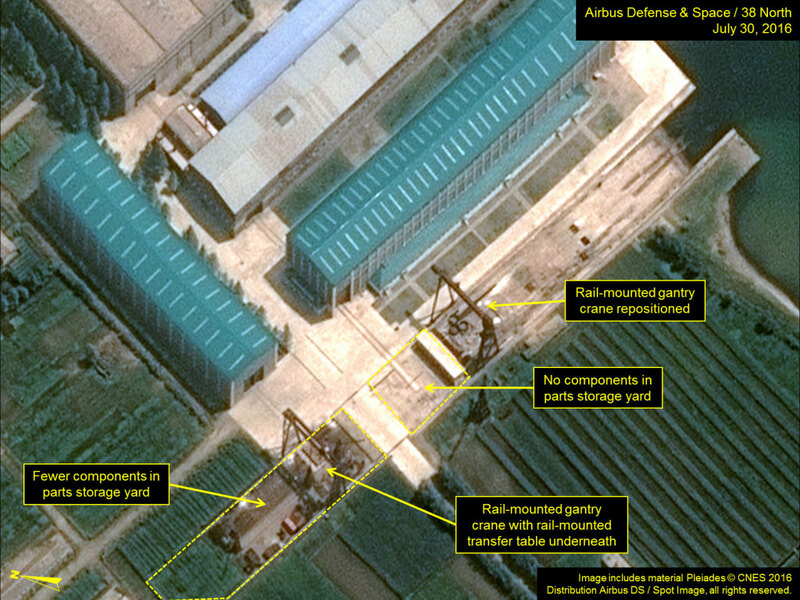 Although not identified specifically in the accompanying imagery, in addition to the two rail-mounted gantry cranes, there are 4 rail-mounted tower cranes in and adjacent to the parts storage yards.